This is not a political blog. I do not express political opinions, at least overtly. Because I have opinions. Oh I have opinions. But this presidential election season had me whaling and gnashing teeth for it to be over, much like that toddler on YouTube. I would much prefer to analyze personal relationships on Jersey Shore than be subjected to more taunts and finger pointing from presidential hopefuls. Much less having to read about it on Twitter and Facebook. So for Thanksgiving, I'm thankful it is over. Or is it? I thought Wednesday would mark a new day. But no. Now I have to hear about the Fiscal Cliff. The result of Congress and the President not being able to do their jobs earlier resulted in this mess now. So now we're back at it. Well let this blog save you time and effort Mr. President and Mr. Speaker. I am putting forth the Jeff For Banks (jfb) Federal Income Tax system that is fair, easy, and balanced. Lest I hear from the Oracle of Omaha about how he pays a lower tax rate than his secretary, I have your fix Mr. Buffett. Rows 1 - 4: All income is taxable, whether it be from earned income, interest, dividends, or capital gains. There is no distinction between them. Row 1: Pre-earned income deductions include health insurance and retirement plan contributions. Each will be capped at a certain level, so those with greater disposable income can't sock suitcase fulls of cash away, and those that have Taj Mahal medical coverage can't use all as a pre-tax deduction. I am not married to treating this prior to row 1. I can compromise. These deductions could be included in the income numbers in Row 1-4 and deducted in the deductions section. But for treatment similar to today's, I have deducted them prior to Row 1. Rows 5-8: Aside from pre-income deductions listed above, there are only three deductions. Boom. Row 5: Households can deduct the poverty rate for the same size family for the area which you live, up to a maximum amount of children. So if you're a good Catholic family and fielded a baseball team full of kids, too bad. I'm not subsidizing you. Control yourself. Row 6: You maintain the mortgage interest deduction up to the median house value where you live. So if you bought a McMansion and have a $300,000 loan, but the median home value where you live is $200,000, then you can only deduct two-thirds of the mortgage interest you paid. No deduction on second homes. Sorry Mitt. Row 7: An ideal America would have its citizens earning what their skills and efforts would allow, taking what they need, and giving the rest away to help those less fortunate. Unfortunately, if high earners did this today, it could drop their effective tax rates below that of their secretaries. We all know how that turned out in the court of public opinion. Poor Mitt had an effective tax rate of 17%. But he gave $4 million to charity last year. If he only kept it in his pocket, or offshore account, his effective tax rate would have been higher and he could have avoided the whole fracas. But no. So we have to cap the deduction on what we give to charities. 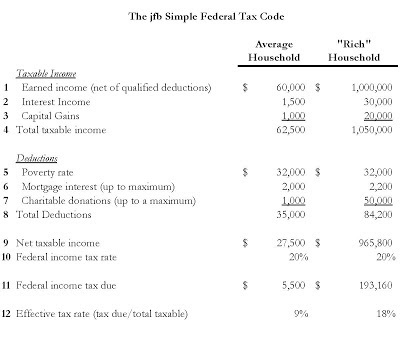 The jfb system proposes 10% of total taxable income up to a maximum of $100,000. Not for profits will hate this idea. But I propose it to shut Warren Buffett up about his tax rate. Economists might not like the idea, saying losing this deduction or that will sap the economy. But isn't our economy sapped already? Politicians will hate the idea, because it will make us think we can go back to the days where politicians actually had real jobs and were only in session part time. Without all this tax code tinkering, they may not have enough to do. Not that they have a lot to do now. Maybe they can slowly dismantle the ridiculous amount of laws on the books that we have to comply with, and law enforcement is tasked with enforcing. There you have it. 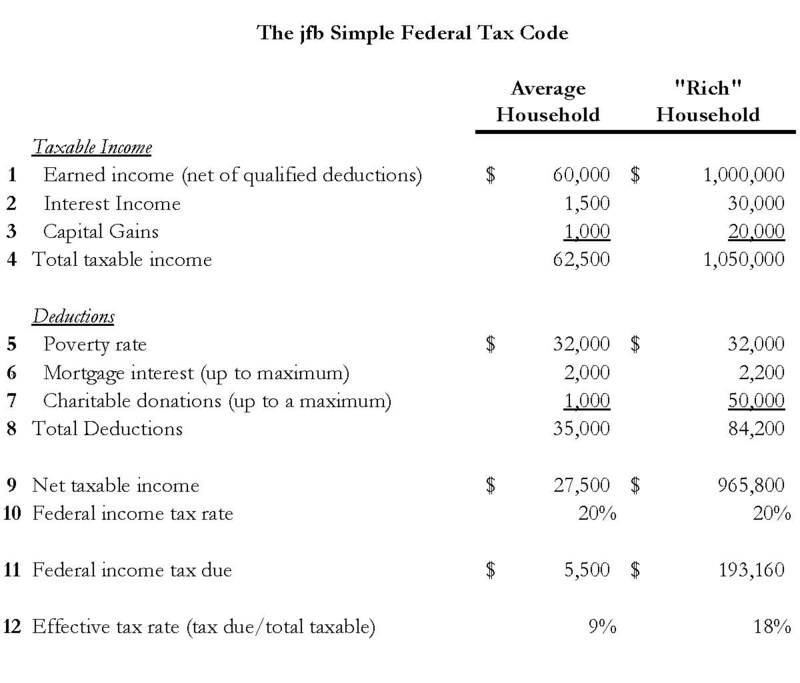 The jfb Federal Income Tax System. It sets one rate, 20%, with few easy to calculate deductions. Heck, if the IRS got its act together, it could have an app on its site so we can do it in 15 minutes or less. Think of all the tax code compliance costs that would hit the bricks. P.S. 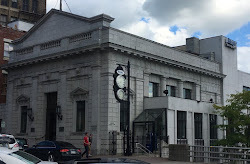 Since this is a bank blog, I should make a link to banking. Put the amount of money you now spend on tax compliance in the bank and sleep soundly at night. There. There is much to be said for the K.I.S.S. (Keep It Simple Stupid) principle. Kennedy had enough trouble being Irish and a Catholic in the Midwest Tom. Imagine somebody being Italian, Irish, and a Catholic. The NY Times wouldn't stand for it! Imagine the headline: Marsico cows to the Pope and La Cosa Nostra! Jeff, what would these two pay under the current system? Very good question. Because there are a host of other deductions available, we would have to make a lot more assumptions to arrive at your answer. Since Warren Buffett and Mitt Romney pay an effective tax rate somewhere in the mid-teens on greater income than is portrayed here, their effective tax rate, and therefore tax dollars, is likely to rise. But they won't have to pay an accountant to come up with the number or a tax strategist to lower their effective tax rate. I think that's an effective tax increase on the "rich" that the "rich" can live with. As for the common family, I think we can handle this system. It's pretty transparent.